Structure renovated into a home in 2010. You may or may not have noticed the stately, black carriage house on the north side of town. Its bold color is unmistakable yet almost camouflaged by its new dark exterior. However, Betsy and Pete Olmsted are not afraid of a little color. 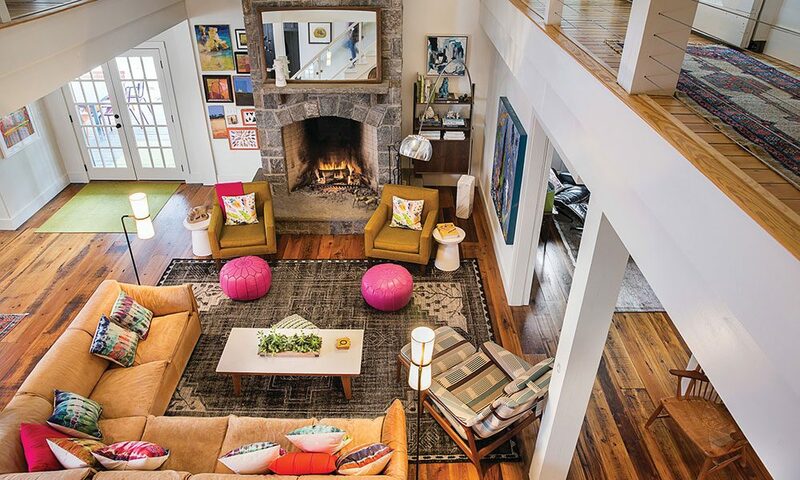 In fact, every room inside this big, old carriage house is bright and cheery. Betsy, a textile artist known for her colorful designs and patterns, has infused the home with a life and vibrancy that is modern, eclectic, and totally fresh. From the modern, orange sofa in the tv room (where the kids play what they call “old fashioned WII,” aka the original Nintendo, on a small tube television) to the gorgeous pieces of contemporary art on the walls, color abounds. The old carriage house was originally renovated into a home in 2010 by builder Robert Courtney and designed by Phinney Design Group and Charlene Wood (of Silverwood Home and Galleries). They retained much of the original details of the original barn but with a stunning post and beam design. The home is now almost completely open concept, with a large windowed cupola in the center of the home, allowing light to filter in though most of the rooms. One of the first things the Olmsteads did when they moved in was to paint everything inside the house white, including the home’s exposed timber frame. It completely changed the feel of the space, giving it a more modern and airy look while also becoming a perfect backdrop for their colorful furniture pieces, art, and textiles. The kids’ rooms are cleverly decorated but not at all fussy, a clear collaboration between a designer mother and her young boys. Every room feels curated but fun, totally livable, and real for a young family’s lifestyle. Betsy’s art studio is in the old stables portion of the building, with the old stalls intact and offering perfect separations between the studio’s different creative spaces. Interestingly, it was this space that really sealed the deal on this home. As a young mother, she really wanted to find a home where she could work from home, close to her kids, but with enough space and separation to run a professional art studio. In fact, one of the things that stands out about this home is that every space seems to serve a practical purpose- whether it’s lived in, worked in, or played in, this carriage house is loved and it shows.